Wacky Races series, Mushroom Man series, various around Chorley and a FTF! On Saturday, we decided to go for last week’s Plan A, which was a trip to the Chorley area to clear up the newer caches there. As Isaac was with me, we changed this slightly and opted to start on the Wacky Races series near Skelmersdale as they are in a great location and have been getting good logs. The first cache of the day was a puzzle cache, which was nice and easy to solve. To find the box, you have to go to a location and then pace out distances until you get to GZ and then use your cacher’s eye. All nice and easy and no problems at all. Next, we started on the Wacky Races series. Try as I might, I could not work out a circular route round them all, so opted to pick some off from nearby roads individually and then to do the final half of them as a longer, circular walk. This ended up working out really well. We’ve not been caching in this part of the country for ages, but remember it being lovely, with gentle hills and some great views over the surrounding areas. It was just as we remembered and we really enjoyed our walk around picking up the caches in the series. Along the way we picked up an older cache, The Wood & The Wire, which we’ve nearly stopped for several times in the past, but never had quite enough time. Very satisfying to finally bag it on our walk around the other caches today. 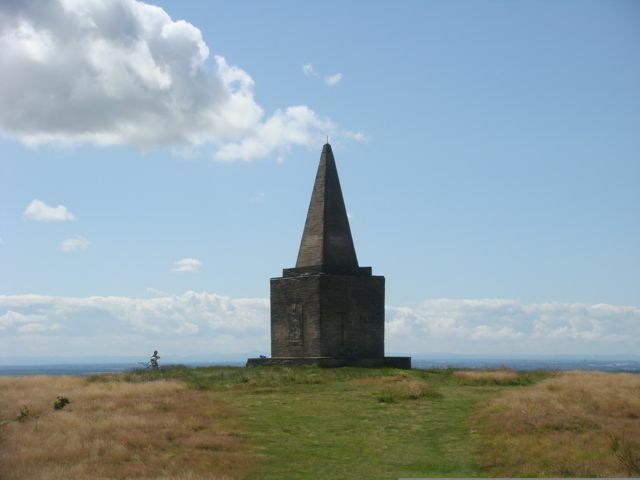 The other highlight of the walk was a trip up to Ashurst Beacon, which is a lovely old monument on top of probably the highest hill in the area. The views from the top were panoramic and with the great weather today, we could see for absolutely miles. I pointed out all sorts of views to Isaac, including Blackpool Tower and the South Lake District hills. We soon arrived in Euxon and picked off a couple of easy drive-by’s before relocating to the north end of the Mushroom Man series, for a nice circular walk. Not much to report here apart from lovely countryside and some nice easy finds (apart from the last one in the series which took us a bit longer to find). After we’d finished the series, we decided to head off toward Chorley and then Horwich, with the ultimate intention of a try for a FTF just north of Bolton. More quick cache and dashes here, with a one in a nice nature area by a hospital and a re-visit to a place we’d been to for a cache before, to bag the resurrected (and re-listed) cache. The cache owner had given up caching, but the cache was still in place, although it was archived for some reason. Another cacher had decided to create a new listing for it, so people could come back and find it. 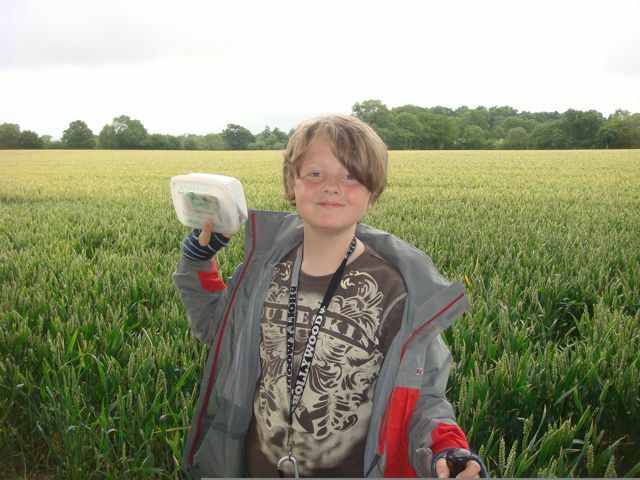 Next, Isaac guided us down the A6 to Horwich for a few quick caches. The first one was by a field with Alpacas in – we could just about make out one in the distance at the top end of the field. We’re assured they are usually much more friendly than this. A quick find at the old Horwich Station, followed by another easy find at the war memorial in Horwich were then had. Finally, it was a short drive over to the north of Bolton for a FTF attempt. This cache was set 3.5 months ago and published 1.5 months ago, but for some unbelievable reason, no-one has come to find it. We parked up by a garden center and set off down the path into a lovely wooded area with a stream flowing along to one side. As we approached GZ, it was clear that the cache was up a very steep and slippery bank. We both scrambled up, with Isaac going the last bit on his own for an easy find of the cache. We were FTF too :-). A really nice spot for a cache and we enjoyed the challenge of the scramble to get the box. It was now tea-time and we were getting hungry so we set off home. As we approached where we were due to get off the M6, I remembered two caches not far off route that had come out in the week. We did not have these on the GPSr’s so we fired up the GC.com app on the iPhone and got the details that way. We parked up and set off for two quick finds – the first of which was the better one as it was in a lovely wooded area and a nice sized box too. Now, it really was time to go home so off we set. 37 finds for the day. Issac was due to be away at scout camp this weekend, so it was just me caching on my own. I’d been watching the weather all week with the original intention of going caching around the Chorley area. By Friday afternoon, the weather looked dismal and as I’m just about fed up of caching in the rain every week, I decided to not go caching on Saturday and instead, hope for good weather early in the week to go then instead. Anyway, Saturday morning came and the weather at home looked ok – not fabulous, just ok. I decided to go off and try the Snow White and the Seven Dwarfs series between Stone and Stafford as it’s been sat on our nearest to home not founds for way too long now. Off I set and soon parked up, before setting off on the walk. These caches are all nice big boxes, but the catch is there is a bigger distance between each one than you usually find – 0.6 miles would be typical of this. Not a problem though as it looked like a great walk (it was!). Not a great deal to report with the caches: all were as advertised and all were easy enough to find. 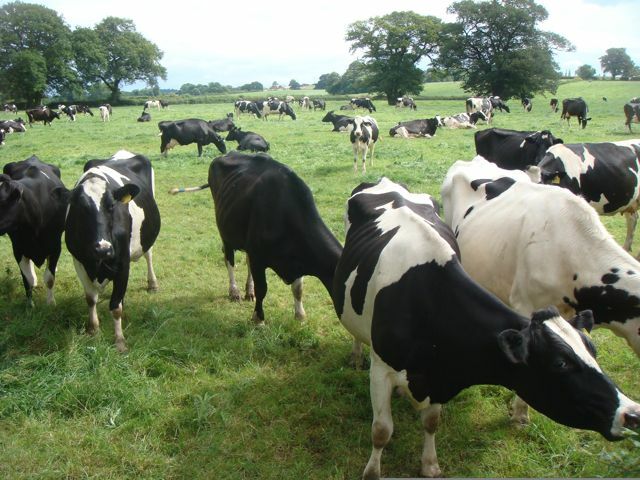 On the way I saw tons of wildlife, including two HUGE pigs in a field I had to cross and lots of inquisitive cows. I arrived back at the Jeep shortly before dinnertime and decided as the weather was still holding, I’d head off to Stoke and see if I could do a bit of a clear-up there. The first one was by Stoke Rugby Club’s ground and was a disaster as I could not find it. I’m pretty sure it’s missing as the hint was very specific and the cache was not there. Next, it was three easy micros in Longton Park, followed by another DNF. This time the cache was in an area of nettles that went above my head height and despite quite a bit of bush-whacking, I could not spot the stump the cache was supposed to be in. One for the winter methinks. I then did a quick cache outside the Gladstone Pottery Museum (not a micro either, which was a shock, given the relatively exposed location), before setting off on foot for Mawgan’s series of 6 caches along a greenway (cycleway) – I wish I’d brought my bike now. More disasters here as I could not find the first two caches. The third was sopping and the fourth had fallen out of the tree it was in and was lying nearby. I decided to cut my losses and move on without doing the remaining two caches as micros in a place much bigger caches could easily be hidden is not really my idea of fun I’m afraid. Things improved totally from here on in and I did not have any more DNF’s :-). The next cache was by the Fenton TV transmitter on top of a small hill overlooking the area. Next, it was an Earthcache in a park not too far from the road. 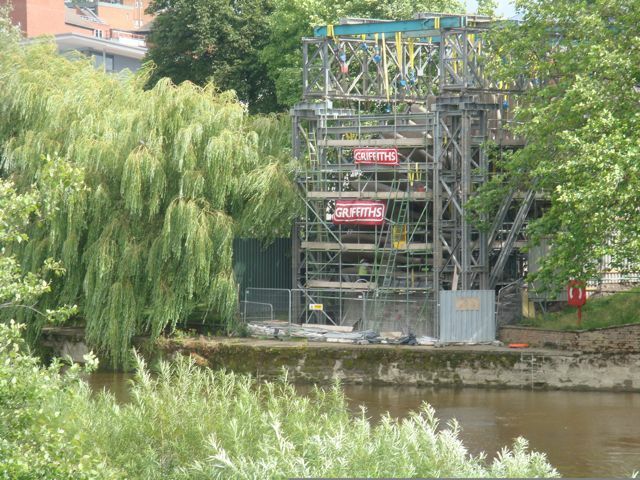 I then headed off into downtown Stoke to see if I could find the new cache set by the Stoke Museums people. It looked like the cache was actually in the museum and all the parking was pay and display, so I moved on elsewhere instead. We’ll have to return to the museum some other time as it looks really interesting. I then headed off to the NE reaches of the city for some more easy finds, including clearing up a DNF I’d had ages ago, on the way to Biddulph. 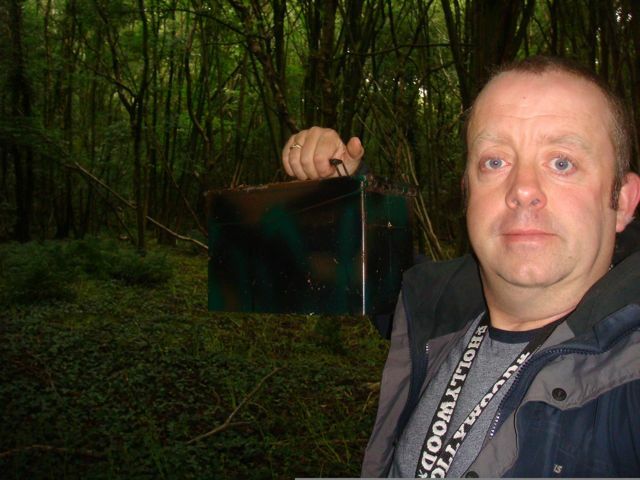 Next, I worked my way over to Apedale Country Park on the west side of Stoke, taking in a few easy caches on the way. Some quick caching round the park saw several more easy finds. 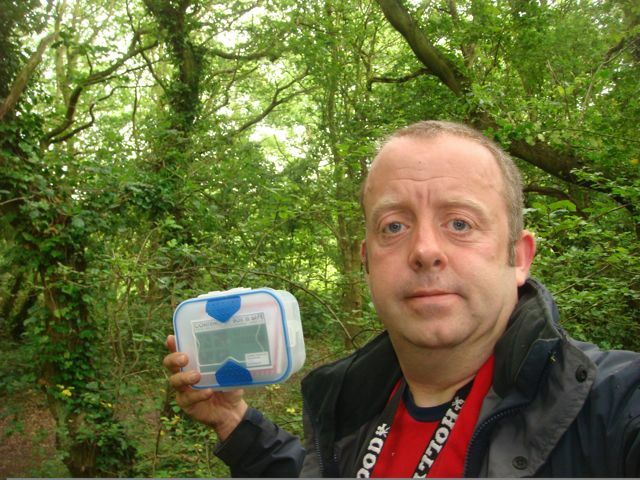 Not many caches to find in the area left now, so off I went to one right by the M6 in Bateswood Nature Reserve. TomTom beeps at us with this cache every time we go past on the Motorway so it will be good to find this one. The co-ords were bang on and the hide was the best of the day by far. I won’t give anything away here, but it’s a different variation on a pretty rare type of hide and very satisfying to find. A couple more caches to finish off the day now. The next one was the best location of the day – a real hidden gem right in the middle of Keele University grounds. This is what caching is all about! 31 finds for the day and I was back home nice and early. Can’t beat that as I’d only gone out to find the 8 Snow White caches :-). Late on Monday afternoon, a new multi a few miles from home came out. I had things to do for the rest of the day so no chance of going out to find it. The next morning was a different story and I had time to dash out as the cache still had not been logged by anyone. I parked up in a very familiar spot by the farm and headed off down the track to stage 1. I say familiar as we used to have a cache down the same track, but it’s been archived for ages now (it was run over by a tractor and we could not find a decent alternative hiding place for it at the time). After a nice walk, I was at stage 1. I checked out all the usual places before I spotted something not quite right and quickly had the details in hand (or rather GPS) for the final cache. We always enjoy this kind of hide, although you don’t see them too often. A great idea. A short walk later and I was at GZ for the final cache. The co-ords were once again bang on so I had an easy find. Great to see another big ammo box – well stocked too. Some fab views over towards Hodnet on the last stage of the walk. Now, back home to get some work done! On Saturday we decided on a return visit to the area of countryside between Birmingham and Coventry. We’ve always enjoyed previous visits to the area so were looking forward to it. The weather forecast was not too promising, with a band of rainy cloud coming over the UK from west to east. The nearest forecast to where we were headed was for Solihull, which showed early rain and then dry until about 4pm. This looked ok for us, so off we set. Isaac guided us off the M42 and those ridiculous “active traffic management” gantries which keep slowing and then speeding the traffic up for no reason at all. We were soon parking up for the Webbie Wander series, which was a set of 12 caches on a circular walk in nice countryside. We decided to do the series clockwise and were soon at the first cache, which was a nice quick find. The next cache was a dog tag, which is not exactly our favourite type of hide (why hide one of these in the countryside when a much bigger box will fit easily). Luckily we had an easy find as we picked the correct hint location to start with. Phew! The rest of the series was easy enough, with the exception of a DNF at the Castle Hills cache. It turned out later that the cache was still there, but hidden very deep in long grass. Not to worry as we can go back and find it the next time we are in the area. We soon arrived back at the Jeep and decided to head off for the Dexter series in countryside by Balsall Common. The first one here was the easiest find ever as the cache was sat on the verge at the side of the road – a muggle had obviously spotted it and assumed someone had lost it, so left it out so the owner could easily find it – doh! The rest of the series was easy with one field early on in the walk looking strangely familiar. I’m sure we’ve done a cache here before, but it looks to be archived now as I cannot find it on GC.com. We had a DNF about half way round the walk as we could not spot the cache in any of the obvious places, so gave up and moved on. The day after we visited, it was found out in the open a short distance from where it should be, so it looks like someone / something had found it and moved it a bit. I managed to lose my really nice caching pen off my lanyard somewhere between the first two of these caches. We did a cache at the side of an old airfield, which is now a racetrack where you can spend the day zooming round in some seriously powerful cars. Isaac is really into cars and loved this one. Next, it was on to the Max’s Favourite Walk series, set around Packwood House, which is a beautiful National Trust property with a fabulous garden with a very nice Yew Garden. On the first one, we’d just done the biz with the cache and were about to put it back when some walkers came past. We made our GPSr’s obvious just in case they were cachers, but only spotted their Yellow eTrex as they were quite a way past us. They turned out to be cachers: maxskitz, fishdreams and mrgammonandmrspea. We made quick work of the rest of the series and were soon heading back to where we parked by Packwood House. Just time for a few quick caches before heading home, so we decided to head in the Solihull direction and see how many we could find. We had intended to park up and do the caches in Tudor Grange Park, but every road seemed to be a Red Route, so parking was impossible. We headed off to do a couple of quick urban caches, which turned out to be easy, although we did have to re-visit the first one twice as there were some teenage muggles sat on a bench right by it the first time we stopped. More quick finds followed and some nice planning by Isaac meant we ended up not too far from the M42 junction and the journey home. 38 finds for the day. We were having a new boiler put in at home today, which involved a lot of banging in the old airing cupboard by my office, so I decided I would be much better out and about going for the 19 new caches in Granville Country Park instead (tough decision that one – not!). I parked up in the main car park and set off. The first cache was very close to the car park and was a really easy find as I could see a neat line of sticks at GZ as I walked up. I decided which one to go for next and off I set. The paths seemed to go a different way than I was expecting so I ended up very close to another cache, so changed my planned route and went to that one instead. A quick find in a place I’d walked past ages ago when doing the older caches in the park. On the way to the next cache, I had to hold on for a few moments as a lone female dog-walker was ahead and I did not want to spook her. After she’d gone on her way, I headed off and was soon at the next cache. Another quick find. Great to see all the caches in the series are nice big Regular sized boxes with decent swaps in. The next few caches were all easy enough and nothing much to report on. The next cache had not yet been found – over the weekend lots of cachers had tried and failed, but there was a co-ords change of about 50ft last night, so I was hopeful of finding it. The new co-ords turned out to be bang on and I had an easy find. A nice bonus of being FTF too :-). A few more caches and I was back at the Jeep. On the way, one of the caches took me to the top of an old slag head (the country park used to be a big mining area) with some great views over towards North Shropshire and Cheshire beyond. I then moved the Jeep round to the next area of the park and dashed in from the road for a couple of quick cache and dashes. One was a nice BIG ammo box, which is always great to see. Another move of the Jeep saw me at another area of the woods I’d been to before, and two more quick cache finds. I then moved the Jeep around to the final location and set off into the woods on foot. I was a bit nervous about the first one as it’s quite close to a primary school, but thankfully the woods were thick and I was able to look for the cache without attracting dodgy glances. The next one was a quick find, then came the fun for the day. The last cache of the series was about 400ft from the bottom of the hill so off I set. As soon as I reached the bottom I realised the ground was VERY boggy. I ended up almost wading though the mud, sometimes knee deep, before getting to slightly dryer land the other side, near GZ. After that, the cache was an easy find. A great series, with well placed caches and all a decent size. I’ve really enjoyed my walk around the area this morning. I checked the GPS and it was 3 hours and a minute from finding the first cache in the series, to finding the 19th one.